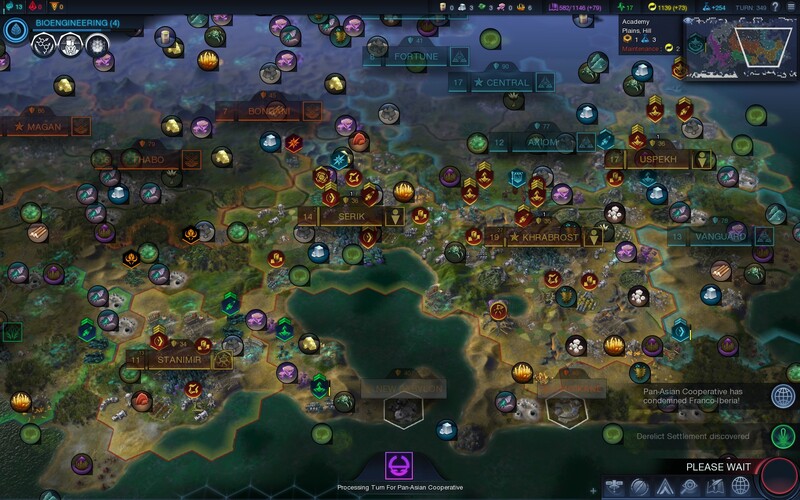 The Refined Geek » Civilization: Beyond Earth: Just…One…More…Turn. I have something of a love/hate relationship with 4X style games. Usually at the beginning I hate them, the complicated web of variables that needs to be balanced properly usually irritates me to no end, especially when I figure out I’ve backed myself into a corner. Whilst that might make put them down initially there’s always that voice at the back of my head that tells me I should try again because this time, it says, you’ll get the balance right. And so the cycle goes until I look at the clock and its 1am…2 days later. The Civilization series has long set the benchmark for the 4X genre and with its latest instalment, Civilization: Beyond Earth, it seems set to keeping setting the standard by which all others will be judged. Earth lies a ravaged husk of its former self. 600 years into the future humanity made a terrible error, The Great Mistake, that is slowly rendering the planet unliveable. Thus all the great nations of the world put their resources behind a desperate plan: they’d send their best and brightest across the galaxy to find new worlds, to start fresh and save humanity from its certain death. It is now up to you, dear traveller, to restart humanity on worlds that are not of our own. Will you remake humanity in it’s own image? Or will you craft a new kind of civilization, free from the bonds of its past? The world is yours to craft. 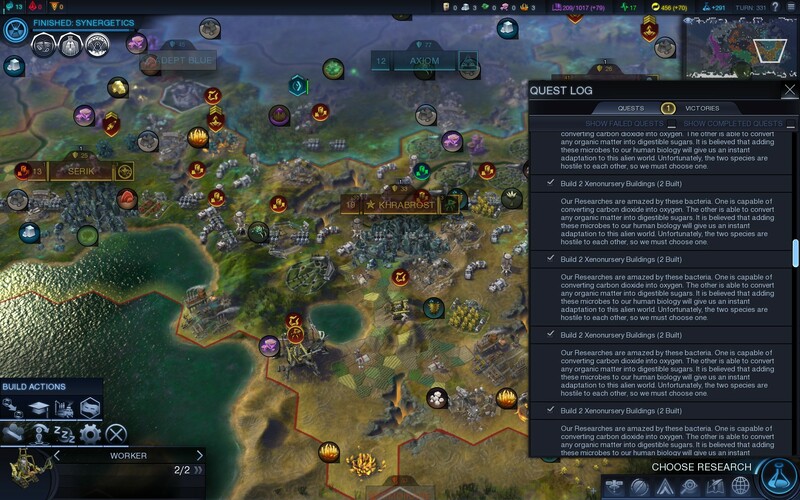 Having not played Civilization V it’s hard for me to comment on how the graphics compare to its predecessor although perusing through some screenshots shows that there’s been some improvements, not least of which comes from the form of a better UI. Like most 4X games Beyond Earth tends towards a more simple graphical style mostly because the screen ends up littered with hundreds of objects in no short order, able to bring even a respectably specced machine to its knees. That being said it’s not an ugly game, especially when you’re zoomed out, indeed it’s probably the best looking 4X game I’ve played. Like all other Civilization games Beyond Earth has a bewildering amount of things to do. It’s enough that, at first glance, you almost feel like you need to read a novel to make sure you know what you’re doing before you click the start button. However, just like other games in this genre, the best thing to do is to simply plonk yourself down and attempt to hammer your way through it, figuring out how each different mechanic works. There’s a semi-helpful AI who’ll pipe up every so often to let you know when something’s happening or there’s a mechanic that needs explaining, which helps a little bit, but the larger overall strategy is still left entirely up to you. With so many options available to you, along with the routine 6+ hour per game play time, you have a recipe for an incredibly addictive game. 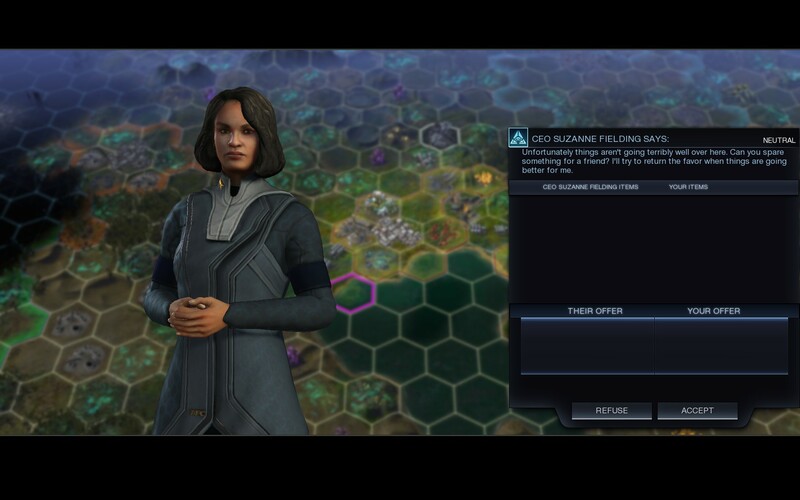 Unlike Civilization games of years past Beyond Earth allows you to craft your own history by making a few choices. Your opponents are no longer historical figures, instead they’re representatives of the various factions of Earth that have been sent to settle this planet. The tech tree that we’re familiar with is gone, replaced with a tech web that sprawls out in numerous directions, opening up several different paths to unlocking technology. Beyond Earth also brings with it a system called affinity which sets the overall tone for how your settlement behaves in this new world. With technology trading removed it’s nigh on impossible to research everything in one sitting, ensuring that Beyond Earth will keep you coming back for several more play throughs. Perhaps the most fundamental thing to understand in Beyond Earth is what all the resources are, what they’re used for and how you can generate the required amount of them in order to unlock the things you want. In my first game I heavily prioritized science which, unfortunately, meant I quickly found myself in an energy hole from which there was little escape. The second time around however I figured out that building out certain resources first were far more advantageous, as was the low hanging fruit in the tech tree. Indeed Beyond Earth, like most 4X games, rewards players for planning out a strategy and then executing it, rather than rushing for the best technology first and hoping your opponent doesn’t get there sooner. One of the things that I don’t think was explained terribly well was trade. It’s a completely optional thing to engage in, however it quickly becomes one of the largest sources of resources that you’ll have access to. Indeed my energy-first strategy often allowed me to fully kit out a new colony with a trade depot and 2 convoys the second it came online, dramatically increasing its capabilities and growth rate. There are downsides to trade, of course, like your convoy getting eaten by native fauna or picked off by an angry neighbour but trade still seems mightily powerful when compared to the alternatives. I’m not sure if it was the difficulty setting I was playing on but the AI seems to have some strange quirks when it comes to reacting to what they perceive as a threat. My blue neighbour, who was my biggest trading partner by far, declared war on me twice for nothing I could clearly discern apart from maybe my huge stockpile of energy. 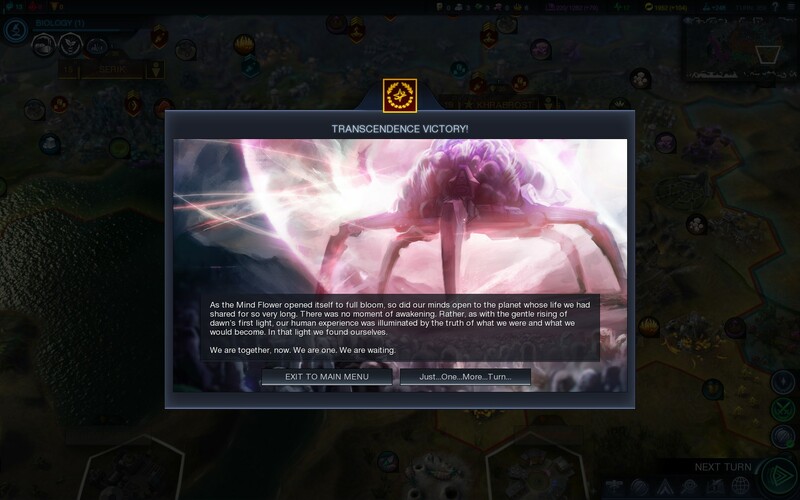 The thing is though that they needed me far more than I needed them so the second they broke all trade with me they lost all means to produce additional units. It didn’t take long for me to whittle them down and get a juicy peace treaty as a result but it still felt like the AI should’ve understood the situation it was getting itself into, rather than attempting to bully me with its puny force. There’s also a few rough edges here and there, like you can see in the first few screenshots in this review. For the most part the innocuous, just seeming to be glitches in certain parts of code that either fail to display something or display it more times than it needs to, but it happened often enough that it did become a little irritating. Since I was coming into this game a little late I usually expect these little rough edges to be gone by the time I get to it so it was a little disappointing to see. That being said the rest of the game runs perfectly so it’s a very small mark on an otherwise smooth experience. 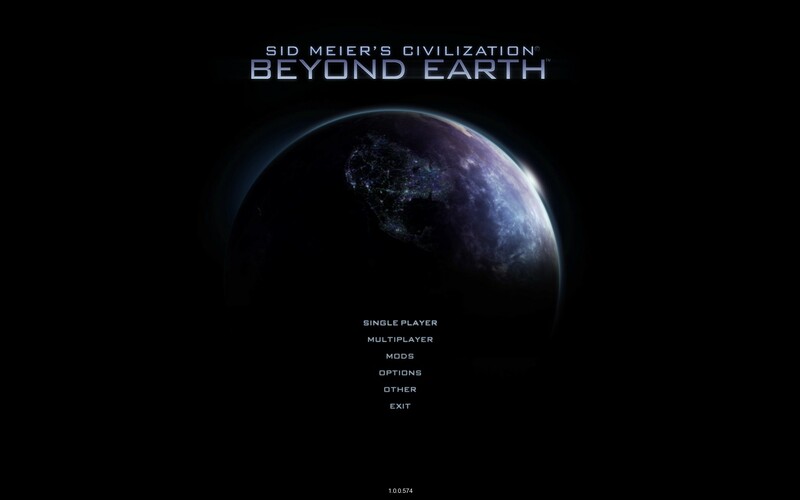 Civilization: Beyond Earth is yet another great example of why Sid Meier’s series is considered the best in the 4X genre. The staggering amount of mechanics, playstyles and strategies that the game puts before you means that there’s always something new to discover or try out, providing nigh on endless hours of entertainment. Like all of the previous Civilization titles it demands a heavy investment of time in order to get the most out of it but should you commit the experience that you’re rewarded with is simply unmatched within its genre. It’s not a perfect experience, lacking a good introduction and having a few rough edges, but it’s still a solid overall experience, one that’s sure to delight Civilization fans all over. Civilization: Beyond Earth is available on PC right now for $49.99. Total game time was approximately 8 hours with 20% of the achievements unlocked. Pingback: The Refined Geek » DirectX 12, Vulkan Could Bring GPU Teaming Between Brands. Pingback: The Refined Geek » Civilization VI: I Had a Life, Once.